Dagny McKinley knows a bit about being driven by one's heart. Her study of motivation in her own sled dog led to a coffee-table book on the subject. She's also attempted to break the world record for most hugs given in a 24-hour period. When the writer moved to the valley from Steamboat Springs, Colo., recently and reflected on the tough economic times experienced by all, the impending season of gift exchange encouraged her to give away something she had to give—in this case, it was 30 copies of her book. 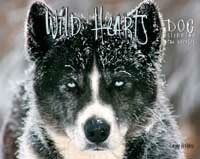 So McKinley will position herself at Hailey Coffee Co. at 9 a.m. this morning, Dec. 16, and hand out her book, "Wild Hearts: Dog Sledding in the Rockies." "I just got into town and I decided to spread some holiday cheer," she said earlier this week. "I know a lot of people have had a hard time, myself included, so I wanted to give away something special to me and hopefully inspire others to whatever generosity they can offer." The freelance writer has an MFA from Naropa University's Jack Kerouac School of Disembodied Poetics and studied writing and journalism at UCLA. The sledding book retails for $34.95.